Mark Donnellan 6 (7) – solid under the high ball and generally went short with the kick out as Armagh pulled men back. Went walkabout a couple of times late on which always gives this heart a flutter. Didn’t have much chance for the goal. Mark Dempsey 6 (7) – quite a debut task for the Moorefield lad, who has developed a reputation as a sticky defender. Clarke was Armagh’s most dangerous forward despite not being truly at his best and Dempsey stuck to his task well without being a spectacular success. David Hyland 5 (6 ) – struggled on Campbell at times and one of those times was the goal of course. Campbell got that ball and turned away from Hyland too easily. Mark Hyland 6 (6) – has been around a couple of years now without breaking into the team. This was probably his best outing to date with one brave block showing what he is capable of. Overall though the full-back line struggled in the first-half before tightening up after the break. James Murray 6 (6) – after a clamour last year for him to be called up, Murray now has a chance to challenge for Johnny Byrne’s wing back slot. Was competent here without making a cast-iron case for himself. Eoin Doyle 7 (8 ) – divides opinion and yesterday was no different. Thought he led by example particularly in the first-half when he was up and down the field driving us on. Whether that left us too exposed in front of the full-back line is a valid question. Overall though I thought he set the right tone when we needed leaders to step up. Keith Cribbin 7 (6) – made more of a case for a wing back role than Murray. Now 30, he should be using all his experience to read the game and I thought he mopped up a lot of ball around the half-back line. Not always the most composed in possession and was turned over once or twice but overall a good outing. Kevin Feely – sadly not on long enough after shipping that heavy bang to the head after seven minutes. Fergal Conway 8 (7 ) – with Feely’s injury Conway took on the senior midfield role and it was a tough battle against Grimley and Sheridan in the air in particular. Worked tirelessly though and that monster point in the second half was inspirational. A close call but I’d have him as man of the match just ahead of McCormack and Doyle. Conor Hartley 6 ( 7) – started very well, winning a lot of possession and using it well. Got us off the mark with a point and followed it up with another in the second half although he faded after a bright start. Good outing and his versatility will come in useful as the year goes on. Aaron Tyrrell 5 (6) – similar to his Westmeath performance he struggled to find enough space to operate against a defensive structure. That’s a concern. Huge talent but can he do it consistently at inter-county level? Eoghan O’Flaherty 5 (5) – the intention was probably for Eoghan to be our new ‘Leper’ making an impact from the bench but he was catapulted straight in given the narrow forward options. Disappointing display when his experience should have helped us in attack. Rarely on the ball and unable to really influence. David Slattery 7 (7) – played in a roving role and was probably our best player in the first-half. Won tons of possession and allied pace with good distribution to produce his best display for a while. Impact tailed off in the second-half and that was perhaps key to our struggles to feed McCormack and Hyland in the third quarter in particular. Ben McCormack 7 (8) – very promising return to competitive action after taking last summer out. 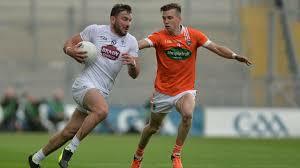 Worked tirelessly to win possession and was the one forward to really drive at the Armagh defence. Scored two points and set up a goal chance for Hyland only for it to be pulled back for a foul on Slattery. Like Slattery, his influence tailed off in the third quarter but he kept working and earned his reward with that last minute free he won. Jimmy Hyland 7 (7) – if it wasn’t for injury time it might have been deemed a disappointing outing for ‘The Bull’ but he showed all his class with those last two frees under pressure on his ‘wrong’ side. He won the first of them himself too. Tightly marked by Mark Shields, something he’ll have to get used to. Fionn Dowling 7 (8) – ‘super-sub’ got a much longer run than usual, virtually the full game. It was a big call from Cian O’Neill to opt for the Suncroft man ahead of Aaron Masterson and Tommy Moolick as Feely’s replacement but Dowling justified that call with a good display, covering the ground and scoring two points into the bargain. We know he can score. Whether he is an inter-county midfielder is another question. But you couldn’t have many complaints yesterday. Aaron Masterson 6 (7) – understandable cries for him to come on for Feely and he showed what he has to offer with that monstrous point. Great future ahead of him in white. Cian O’Donoghue 6 (6) – usual battling qualities in his two spells on the pitch. Not on long enough: Jason Gibbons, Padraig Nash.